HEALTH INFORMATION MANAGEMENT (HIM) / MEDICAL RECORDS MANAGEMENT (MRM) SERVICE is a service component of Records&QA services. This service component will work together with your Health Information Management (HIM) / Medical Records Management (MRM) Department to identify the strengths and challenges of your HIM / MRM Department, as well as identify and report opportunities for performance improvement. Once these areas are identified, HIM / MRM Service can help re-engineer your HIM / MRM department and customise education and training to maximise productivity and ensure compliance to best practices. 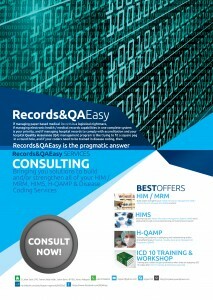 Click on the image on below to view the advertisement for Records&QAEasy Services on HIM / MRM.